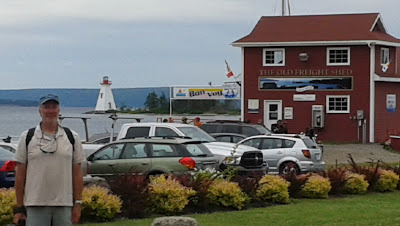 Cape Breton Island is a huge island NE making up the NE third of Nova Scotia. It's split by the gigantic saltwater Bras d'Or Lakes. The lake is surrounded by hills on each side and the area has a quiet rural feel to it. There are some large towns on the outer shores of Cape Breton Is, but we didn't go there. The area has a very long history of European habitation and conflict. In the 1600s, French settlers arrived, and the area was attacked and ultimately taken over by the British in the 1700s. Somehow some of the First Nations natives managed to survive and still have a small presence today. After a night anchored in St Peters and some shopping, we sailed up to Maskell Cove, which is a terrific protected little bay. Oh, look! Another lighthouse, they're everywhere. The town of Beddeck is part way north up the lakes. Beddeck's claim to fame is Alexander Graham Bell had a large summer home nearby. So there's a fine museum about all of Bell's technological research and inventions. We went to a music session at the local yacht club, but unfortunately wasn't nearly as good as the performance we attended on PEI. And Bill bought some new Keenes (watershoes) in town, since a jug of engine oil burst and ruined his old sandals. The weather turned rainy and a good set of wind conditions arrived for us to sail along the main coast of Nova Scotia towards Halifax. So we decided we better move on. We had another good sail south through the lakes, back out the locks and across Chedabucto Bay 50 miles to Canso Harbour, dropped the hook and had a quiet evening before starting our coastal passage to Halifax. We got a berth at the Silver Fox Curling and Yacht Club, right next to the Holland College Maritime Training facility (and fuel dock). It was really warm but we went for a bike ride and stocked up on lobsters. The next day we moved SE towards Charlottetown, capital of PEI. On the way we passed under the impressive Confederation Bridge. It curves over the Northumberland Strait, which divides PEI from New Brusnwick. It's 8 miles long and 60 m high in the center (~180ft). The strait is icebound much of the year. We found a pleasant anchorage just out of Charolottetown the first night, and then got a berth at the yacht club the 2nd night. Charlottetown is visited by cruise ships, so it has a cute old downtown. 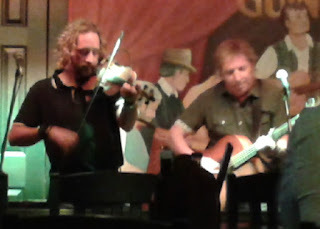 After the usual grocery shopping expedition, we enjoyed some terrific fiddling at the Old Dublin Pub. Gotta keep moving, so the next day we motored (again!) in calm waters with some good current push to Murray Harbour at the SE end of PEI. It was an idyllic estuary for our last night in PEI. Unfortunately, the only photo I have from there is one of the 1,000s of lighthouses there must be in this country. They're everywhere. This one has a little maple leaf on it. The nearby shore is also very rugged, but there's a bowl with a village in it. My photos don't convey it's beauty. Then there was Cap Espoir, (Cape Hope), all in a few hours sail. The next day, we continued south, motoring all day, 93 miles, 14hours (Ugh!!! ), in dead calm, to a different, but beautiful and peaceful place, Baie du Vin in Miramichi Bay. It is very low lying, so it's hard to take interesting shots. So just take my word for it. We stayed a couple nights, and did a bunch of boat chores the next day. Bill replaced the head pump, which had been an unpleasant problem for months. Yay Bill! Then yesterday, July 11th, was another long motoring day in dead calm to Summerside, PEI. Another major milestone. And we passed the 1,000 mile mark in our cruise. AND we're now on Atlantic Daylight Time, 4 hours ahead of Seattle, 3 hours after UTC! Whoo Hoo! Unfortunately, we picked another lumpy spot to anchor with lots of wind and tide sloshing around. This morning we moved to the marina, did laundry, went for a bike ride in muggy sunshine and had lobster for dinner. I just buy them pre-cooked and we have a messy meal in the cockpit. Anchorages are few along the south shore of the river, so we had some long days either sailing or motoring to get to Gaspe. The cape is very dramatic, but unfortunately we rounded after dark, arriving at Gaspe town at 1am. It's a great, sheltered bay and we were able to drop anchor and have a restful night. We stayed another couple nights before heading south. It's a terrific area, and we could have stayed longer. Lobsters were on the menu again. There was another cruising sailboat anchored there, Cristata, of Victoria BC. Terry and Jannine have been on a multiyear circumnavigation and gave us some great tips. We hope to see them again somewhere, sometime. As we left the Baie de Gaspe, we took a short detour to see Cap Gaspe. (pronounced cop gosspay) in daylight. It's very dramatic and marks the transition from the St Lawrence River to the Gulf of St Lawrence. Sorry, I've lost track of the mileage. July1st, Canada Day, we left Quebec riding the 4-7kt current downriver. We made one attempt to anchor in late afternoon, but the anchor just clanked across the rocks. So once again we had to go to a marina. There are very few in the area, and even fewer with enough depth "profondeur" for our 6.5ft draft. The Port de Refuge at Cap de l'Aigle at the bend was our refuge. 74 miles covered. 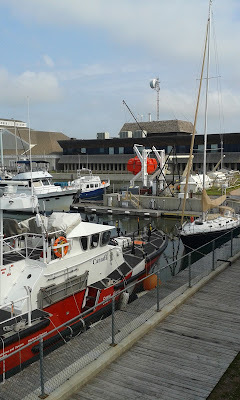 As always, the young marina staff give us a nice welcome and we're glad to make their brief acquaintance. Most speak some English, but not all. I (Kathi) speak French, but I have a really hard time understanding others on the phone and especially on the radio. So I always have to ask them to repeat themselves, and sometimes they just resort to English, in good humor. The radio weather is a real challenge to understand, but if you have the patience, eventually they broadcast in English. The CBC radio here is in French, so I listen a lot to "exercise" my ears. It's working.. Meanwhile, Bill's gotten the HF radio working again. He replaced the cable between the modem and radio, so he can get the gribs, which are interesting to compare to Canadian Meteo forecasts. We arrived at the famous Saguenay River and fjord. It resembles the mountainous passages of BC. We found a fine little anchorage tucked into a really small bay. 40 miles covered today. All night the chain grated over the bottom as the current and wind pushed around. We'd been in salt water for several days now, so the tidal zone was covered with seaweed. It rained hard overnight so the waterfalls were gushing. In contrast to the past few weeks, the depths are great here. At the foot of one waterfall, it's 250+ ft deep. The next morning we motored up the river to see the Beluga whales, and we didn't have to go far. They are bright white and easy to spot as they feed along the shores. There are few boats, just 2-3 whale watch boats. In preparation for crossing the now very broad St Lawrence river to the south shore, we anchored near the mouth of the Saguenay at Tadoussac. What a night, it was really windy and the current churns and splashed roughly around the boat all night. Oh, and the chain rattles as it drags around as well. We lay awake until 3am wondering if the boat was secure. In the morning, Bill found we were only 24ft from where we dropped the hook. July 3rd, we set off early to cross the St Lawrence, sighting beluga and pilot whales feeding at the confluence of the 2 rivers. It was sunny with high overcast, with a wind forecast of 20-25kts SW. Perfect! 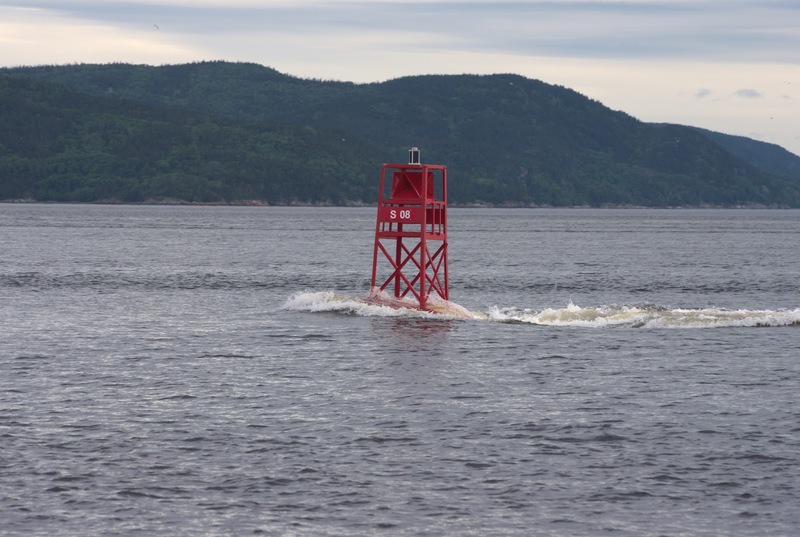 Our timing for the tide was perfect and we briefly saw 7 kts of current on top of our 7 kt boat speed as we passed this buoy at the mouth of the Saguenay river. (Bill's Sigma telephone lens died a painful death right after this shot was taken). Eventually, we were barreling along at 8-10kts over the bottom with a reefed main and small jib. As we approached our destination, turning behind a high point Anse a' L'Orignal at the Parc du Bic, the wind accelerated to 32kts! Dang! We dropped the main and returned to the river, winds went back to the 20s and we motored to the marina at Rimouski.... again. 58 miles covered from Tadoussac to Rimouski.